For month after month, year after year, the citizens of the mountain stronghold known as Deephall have been in a state of perpetual war. Their own dead rise and march upon them, bringing more savagery with each renewed attack. As the undead hordes grow stronger, pernicious dark priests seek to capitalize on the stronghold's weakness and claim it as their own. Now four heroes are all that stand between Deephall and its inevitable destruction. Bring legendary heroes and infamous monsters to your Descent: Journeys in the Dark Second Edition game with the Guardians of Deephall hero and monster collection. Explore the unique strengths and abilities of these monsters and heroes by playing the included quests individually or through the use of rumour cards. 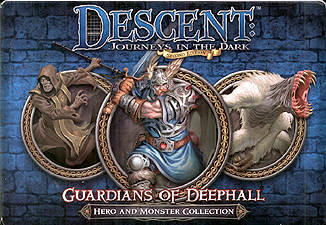 With 4 heroes, 3 monster groups, and 2 new quests, the Guardians of Deephall hero and monster collection gives fresh options to your Descent: Journeys in the Dark game.